REINSW is on the road again in 2019! From coast to country, from the city to the bush, we're bringing you a program packed with the industry information and networking opportunities you've asked for. 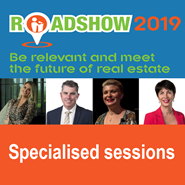 REINSW is on the road again in 2019 with sessions that will keep you relevant in a changing market. You can also gain 12 CPD points from attending the Roadshow! Four hours of interactive training that includes specialist concurrent sessions to suit sales agents and property managers - Roadshow will keep you current in a changing market. Be in the draw to win a $250 voucher for training with REINSW. Find out more at the Roadshow. IMPORTANT NOTE FOR GROUP BOOKINGS: To purchase multiple tickets, click the 'Enrol now' button, select your session and add to cart. On the shopping cart page, please check the 'Group enrolment' checkbox. Leanne Pilkington is Managing Director of real estate group Laing+Simmons, 2017 REB Thought Leader of the Year, and President of REINSW. Leanne has more than 25 years in the industry, developing an extensive knowledge of the full spectrum of real estate services, including residential sales, property management, retail management and development. Overseeing the whole Laing+Simmons group as well as focusing on the growth and development of each franchise, Leanne is instrumental in developing new products, services and training systems to meet the varying needs of each member of the group. Tim McKibbin is the CEO of REINSW, a position he has held since 2007. Tim previously acted as the REINSW’s Legal Counsel where he was regularly required to advise agents on agency agreements and practice issues. Tim is a solicitor and accountant, and specialised in property and taxation matters when he was in private practice. Tim regularly speaks to the media on property market issues and trends. Tim is also a member of the Property Law Committee of the Law Society of New South Wales. Tara is REA’s branding specialist with a first-hand knowledge of the power of the online world in real estate. A world-renowned speaker, Tara regularly presents at industry events on technology trends, online content and digital strategies. She also works with individual businesses to ensure that they are utilising technology to their best advantage. Tara's passions lie in enhancing the efficacy of online profiles, offering ways to create and continue relationships online, and empowering real estate agents and agencies with the tools they need to succeed in their businesses. Session 1 - "Keeping You Relevant in a Changing Market"